Haven't received anything? please contact support@sunnywins.com for assistance. Join the brightest new slot site Sunny Wins where there is never a dull moment. 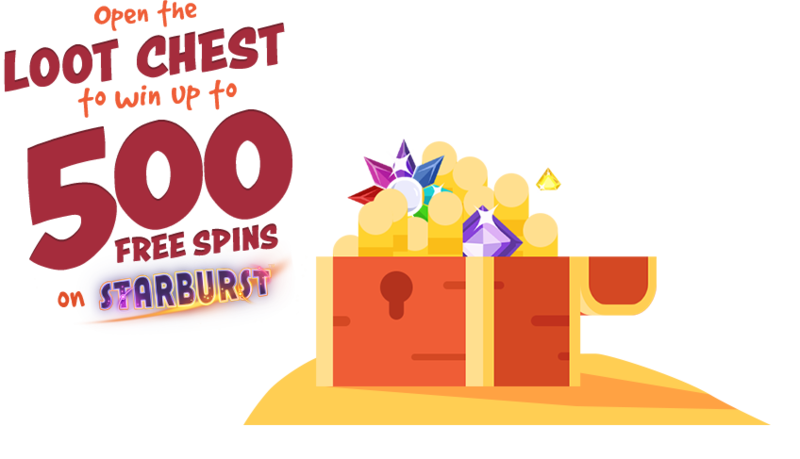 Unlock and open your Loot Chest when you arrive to win up to 500 free spins! Relax on the beach and enjoy hundreds of the hottest slots games around. Top up your tan or build a sand castle whilst playing on your mobile or tablet. Grab your pale and bucket and search the island for hundreds of buried trophies. Join us at Sunny Wins and start winning today! Sunny Wins is operated by Jumpman Gaming Limited which is licensed by the UK Gambling Commission ('UKGC') for customers in Great Britain and the Alderney Gambling Control Commission ('AGCC') for customers outside of Great Britain. All games on Sunny Wins are regulated by the UKGC or both the UKGC and AGCC. Registered business address (no correspondence): Inchalla, Le Val, GY9 3UL, Alderney.